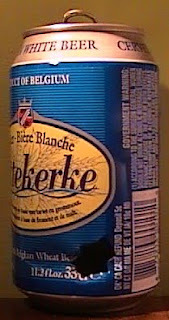 i definitely prefer wheat beers chilled, this was warm and shaken up in my bag. finally i've come across another can that is thicker than the rest, it was actually difficult to open and now that it's empty i can feel that it's a little heavier than most 12oz cans. i do like it better than the wittekerke rose even though the rose is easy to walk around with in public because it doesn't really resemble many american alcohol cans. if anyone can get me some bavik pils that would rule!